Our ever popular jazz group continues its exploration of the jazz repertoire for another ten sessions, plus a full evening performance. 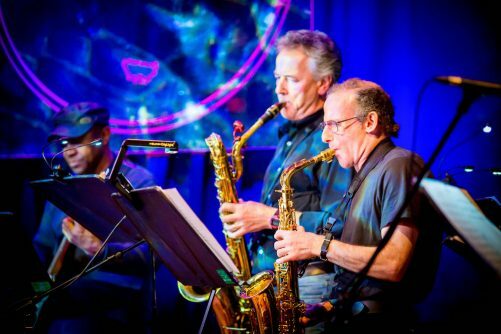 Jazz Foundations offers a chance to blow through and rehearse arrangements of great compositions in a mixture of jazz styles, from Miles Davis and Ornette Coleman to Tom Harrell, Stan Kenton and Benny Carter with maybe the odd bit of Shakatak thrown in for good measure. The musical arrangements are adapted to suit the instrumentation of the groups and offer solo opportunities for all who want to take them. Munch offers guidance and support in elements of improvisation, use of scales and time, phrasing, and more. Sessions take place in a friendly and supportive atmosphere, and new members are very welcome. We especially need trumpet and trombone players. We provide a drum kit, small practice amps, hand percussion, a keyboard and a vocal mic with small PA if needed. Rhythm section players (bass, drums, keys and guitars) may be required to play alternate numbers if the group has more than one of each subscribed. Intermediates are players who have at least two years of playing experience, who play with confidence, understand music notation (essential for horn players) and have basic skills regarding an approach to improvisation. The aim is to build improvisation skills and practice reading notated charts in a large group setting. Intermediate – advanced players are those who play and read music with confidence, have played jazz for more than two years and have reached a moderate standard of playing in groups and jazz ensembles, have basic reading skills and some knowledge of improvising over a given tune. If you are unsure which class you should be in, sign up for one and you can always switch if necessary. This is a ten-week course of rehearsals plus a performance for those that are up for it!